I’ve been wanting to try a West African style peanut stew for a while now, but for some reason never got around to it. Well this past week I decided it was time. But of course I had to alter it a bit to make it a little more interesting. 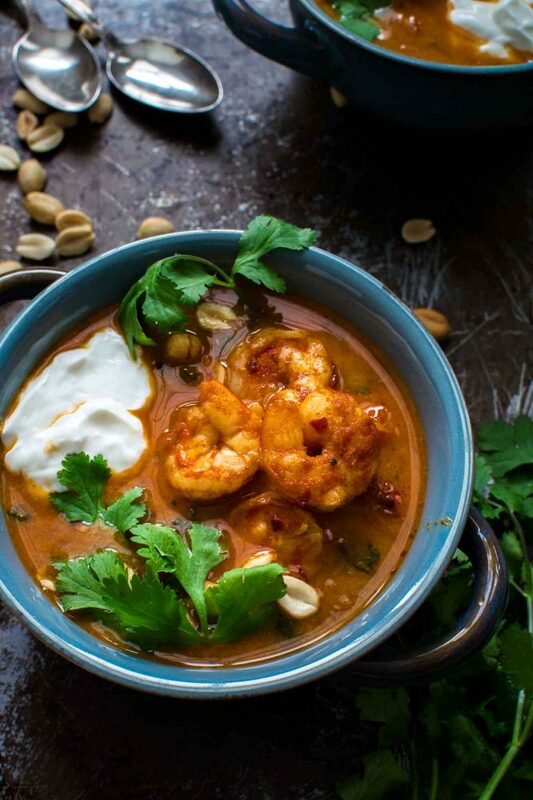 Enter my peanut soup with harissa shrimp. I looked at a few recipes online and picked different things from the ones I liked and came out with my version. It’s fairly similar, but with a few additions/alterations. Mainly adding harissa shrimp and sour cream as toppings. I also decided to use both fresh and canned strained tomatoes, instead of just one or the other. The consistency is somewhere between a soup and a stew. Or a stoup as Rachael Ray used to call it. Anyone else obsessively watch the food network when they were younger? It was the cool thing to do… Anywho, this soup has a nice peanut-y flavour, but not so much that it’s all you taste. It is a healthy, filling meal that will feed 4-6 people. With sweet potato, tomatoes and mixed greens, there’s lots of vegetables to help you get your daily 5-10. In case you’ve never had harissa before, it is a spicy condiment usually in the form of a paste. The one I have is a spice mix, which works better for me. Harissa isn’t consumed much in our house and dry spice keeps longer. The brand I used is epicure, but you may be able to get the President’s choice black label variety, order the paste online here, or check any grocer that carries unique items . As always, everyone has different spice tolerance, so adjust according to your preference. I used two teaspoons and found that to be a good level of heat for me, but Josh found it a bit too spicy. Also, I used frozen mixed greens, which was a combination of collard greens, spinach and kale. Feel free to use only one of those greens and by all means use fresh if you have it on hand. And if you can’t find strained tomato sauce, a regular tomato sauce should work fine. 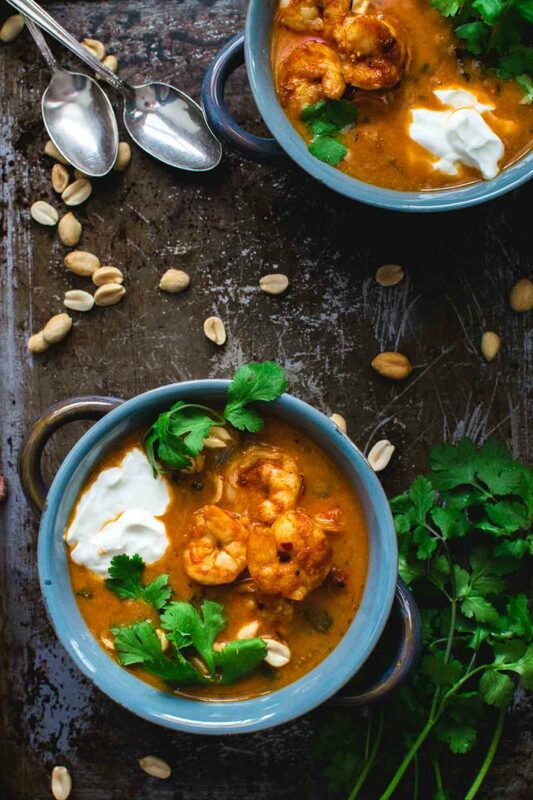 A warming, spicy, peanut-y soup, that's chock full of vegetables and topped with harissa spiced shrimp. Heat 1 tbsp oil in a large pot over med-low heat. Add the onion and fry until translucent. Add the garlic, ginger, and red pepper flakes, and cook one minute, until fragrant. Add the remaining soup ingredients (minus the toppings), and bring to a gentle simmer. Cook for 20-25 minutes, until sweet potato is cooked. Heat the remaining oil in separate pan over medium heat and add the shrimp. Add the harissa, lemon and honey to the pan and cook for 1-2 minutes per side, until shrimp is cooked through. 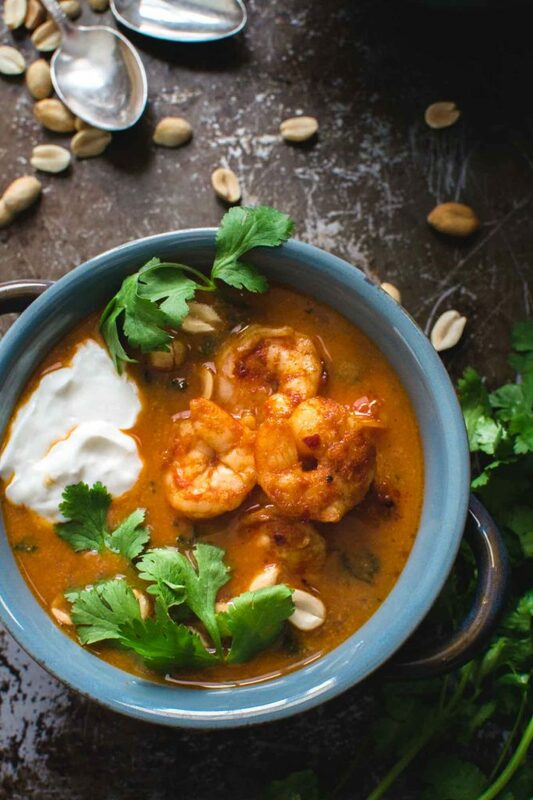 Laddle soup into bowls, top with sour cream, shrimp, cilantro and peanuts and serve!